Gini is the smallest yet the most powerful Access Point in the world. Gini is the smartest and the most intelligent Access point. It has the combination of industry’s best hardware platform and operating system.The hardware platform has been designed with the latest Atheros AR 93XX series processor and on board higher flashing and processing memory. The operating system is design to meet all SOHO and Enterprise requirements of Routing, Nat, QoS &Content Filtering along with stable operation even when the concurrent user base is very high. Gini offers ultra secure wireless network with 256 / 128 / 64 bit WEP, WPA,WPA2, Radius & 802.1x encryption. Gini has the most powerful and intelligent operating system that balances enterprise features including seamless and intelligent traffic shaping over wireless network when multiple devices are installed in one premises. Be it at home or office, wireless user always dreamt of a limitless wireless Gini ensures seamless coverage with Zero Black Spots. SOHO Access Points grossly disappoint users when it comes to large coverage or more concurrent user bases. Smart Gini can be deployed in multiple numbers to create Seamless, Self healing and Redundant Wireless Network wired or wirelessly. 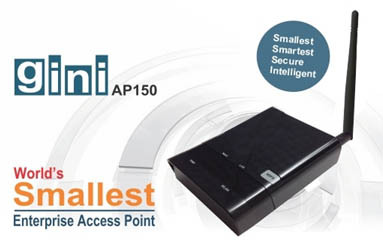 The solution offered by Gini is 50% more cost effective than any other enterprise Access Point. Unique features like DHCP forwarding for the Fast Roaming, Authentication via captive portal, Integrated HOTSPOT Clients such as Sputnik / Chilli Spots / HOTSPOT System, OSPF & OSLR RF Routing, (-105) RX Sensitive, STP Protocols and Advanced QoS put Gini on the top of the index when compared with similar products available in market. Other key features includes Bandwidth Optimization, Content Filtering, Packet Prioritization, 256bit Ultra Secure Encryption, 255mac ID binding. Gini offers industry’s most secure wireless network. You can create 2 wireless network in un bridge mode to offer only Internet facilities on guest wireless network and Intranet + Internet on office wireless network. Since both wireless networks have separate IP range & different encryption the Guest / Foreign user can never Access office network thus ensuring 100% Secure Enterprise Wireless Network.